You should learn how to clean a gun as soon as you buy one, as you do not want to start shooting it if you do not know how to keep it in good working order. Maintaining a firearm is a part of disaster preparedness and part of protecting your family and what you have. If our country were to experience a complete economic collapse, individuals will be looking to take advantage of those who have not prepared for such an event. The steady march of technology has not left firearms behind as newer guns are machined with much more precision than older ones. With some of the early models of very fine guns you can actually hear the parts rattle! You could throw the guns on the ground, kick them around until they were filthy and you still could fire them without any jamming. The newer handguns are machined with such precision that even very fine dust can render them a chunk of useless metal. Regardless, whether your firearm is new or old however, you still need to know how to clean a gun. The number of different kinds of guns is about equal to the number of answers to how to clean a gun. Here are some basic rules that apply to any gun that needs cleaning. Clean from breech to muzzle, the way the bullet travels. Otherwise you will push dirt particles and residue from the barrel into the clean chamber and receiver. Center the tip and rod carefully before inserting into the barrel to keep it from damaging it. Use a clean patch surface every time you go down the barrel. Just like mopping the floor and rinsing it out, you would not push a dirty mop back over a clean section of the floor. Never run a brush in the barrel first. The brush will pick up dirt, powder residue, moisture and deposit it in the chamber and receiver. Do not go back and forth with your brush as that is like taking a wire and bending it back and forth, which will weaken and break it. Don’t reverse it while in the bore. Don’t use too much solvent/lubricant. When learning how to clean a gun, keep in mind a few drops will do nicely as an excess amount can drip down into the trigger housing and cause a gummy trigger. It can also get into the wood stock and damage it. Step 1 - Prepare your work area. Only work in a well-ventilated area since you are using toxic chemicals. Have a plastic trash bag ready in which to dispose of soiled cleaning cloths immediately. Step 2 - Wear safety goggles. From time to time solvent is flicked off brushes and can easily get into unprotected eyes. Step 3 - Engage the safeties and make sure the muzzle is pointed away from you. 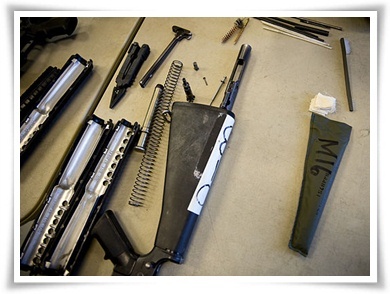 Remove ammunition from the work area as solvents can damage it causing a misfire. Step 4 - Field strip your handgun that is break it down into its major components of barrel, slide, guide rod and magazine. On a revolver, remove the cylinder if it is a single action gun and if a double action just swing out the cylinder. Step 5 - Clean the interior, or bore of the barrel, where all the action takes place. The residue left in the barrel after shooting can affect your aim and damage your pistol. Push your bore brush in the direction the bullet travels, not back and forth. Step 6 - Clean the frame and other components with solvents then wipe off the residue. Step 7 - Use a minimal amount of oil to lubricate your handgun. Step 8 - Finishing up. Put your gun back together and cycle the action through a few times to spread the lubricant. Deposit it in a safe dry locked container. Now that you know how to clean a gun make sure you store it safely and cleanly until next use. Many locking safes are available that allow quick access to your weapon in case of extreme emergency.